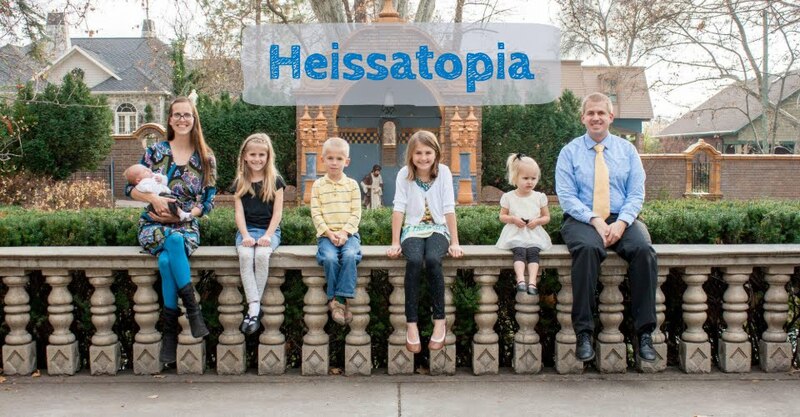 Heissatopia: Happy, happy! Joy, joy! Ever since Tuesday afternoon, Rachel has been practically perfect in every way. It's been so nice—she's been helpful and obedient and hasn't thrown fits. Lovely, lovely, lovely. Last night when she was saying her bedtime prayer she prayed that "Satan won't come into our home." We've had some pretty lengthy discussions recently about how when we make bad choices (eg. throwing huge fits and being disobedient and using unkind words) then we're making Satan happy and are inviting his spirit into our home, but when we make good choices (eg. being helpful and obedient and kind) then we're making Heavenly Father happy and are inviting his spirit into our home. Rachel's been very concerned about having Satan in our home for the past few days and if she starts getting uppity all I have to do is ask her who she wants to please...Satan or Heavenly Father. I'm so glad that she wants to do what is right, even though sometimes it seems that making the right choice is boring or hard or unfair, because choosing the right is really what makes us happy. I know I have been happier the last couple of days and all the evidence I've seen indicates that she's happier as well. It's just so nice when I ask her to empty the dishwasher to have it happen immediately (and happily) instead of having it take all day (and involve several fits). It's nicer for both of us. I remember my mom always saying, "You can _______ and be happy or you can _______ and be miserable, either way you still have to ________." The blanks were filled in with anything from "do the dishes" to "sing in sacrament meeting" to "walk to school" or anything I didn't want to do. It was a good lesson to learn because as a grown up there are so many things that I do simply because they have to be done and not necessarily because I want to do them—especially now that I'm a mother—but I know that I can always choose to be happy about doing what needs to be done. I also remember, years ago, coming across a scripture in D&C 123:17. I think eventually I may make a plaque of it and hang it in our home. "...let us cheerfully do all things that lie in our power..."
I think it's a good motto. As I read about Rachel not throwing fits Amy was throwing a BIG fit. Haha. Lovely.